Thinking of installing instant garden areas with freshly screened seating zones? A clever way of achieving this is to define spaces with portable planting troughs and trellis. As an addition to our new square metal planters collection, John and the workshop team have designed and hand-crafted some super-smart rectangular trough planters, some with built-in trellis for training taller climbers. Whilst standalone vintage troughs are delightful, they are often only available in ones or twos and, especially if made of lead, may warp and distort. 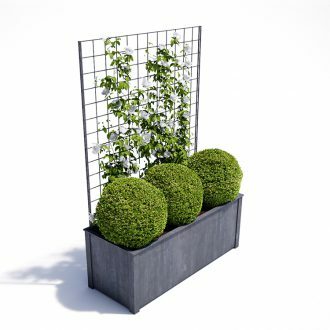 These new long-lasting, galvanized steel planters can be installed in series to create any size of garden screen or display. The handmade touches also still say ‘craftsmanship’, which sits so well in the vicinity of heritage properties and contemporary architectural environments alike. In domestic gardens, Garden Requisites’ new rectangular, long metal planting troughs can be used to deliver immediate lower-level definition of separated spaces, particularly patios, general seating and pool areas. There are plenty of planting options. Low or medium height hedging will get at least a 40cm head start when uplifted by a trough planter. If gardeners are nervous about box (Buxus sempervirens) blight then there are some excellent alternatives including Lavender, Rosemary, small-leaved holly (Ilex crenata), any of a variety of colourful Hebes or far larger options such as the classic Yew, Bay or Olive tree. The optional built-in trellis (with either diamond wirework or square trellis pattern) is another way of more swiftly taking screen planting higher. Think sweet-scented climbing Summer jasmine (Jasmine officinale) under planted with Lavender. Lovely for local bees & butterflies too. Beyond hedging plants there is a huge amount of choice for trough planting. If you don’t have a planting scheme in mind, drop by our square metal planter & troughs Pinterest board for some pinspiration. Cafés and hotels, especially those spilling on to busy pavements or restaurant terraces, can also be brought to life with sturdy troughs of well-tended plants, orchestrating a comforting sense of semi-privacy and calm for guests, customers and visitors. Container planting is so often a bit of an afterthought in many businesses but can be such a welcoming, business-enhancing feature for visitors and employees alike. Office building entrances, courtyards, terraces and balconies can be set off with well-placed trellised troughs – clearly delineated, new places to meet and greet. Crafted from rust-resistant, hot dip zinc-galvanised steel, with drainage holes, Garden Requisites’ heavy duty troughs and planters are a sound investment for any business. If you don’t employ a gardener to plant and tend, do keep an eye on our blogs and pinterest boards for ideas. Because of their landscaping longevity, our new troughs and square planters are already proving popular with British garden designers. John has constructed the planters from British steel so we can hand-on-heart say these are British-made from home-produced materials. For such a seemingly simple object, every element has been considered for designers and gardeners – from a lip for easy lifting to ground-clearing feet and well-positioned drainage holes. As we mostly make to order, bespoke sizes are also no problem to arrange and trellis can also be painted, if needed, to match existing schemes. A series of top-quality, complementing troughs, planters, wall and free-standing trellis, garden arches, gazebos, obelisks and even door canopies, all sourced from one supplier, can make a garden designer’s job, an easier one. Whatever your situation, improving your own or a client’s garden or beautifying your business premises, a pop-up garden made with some smart troughs will deliver smiles all round!